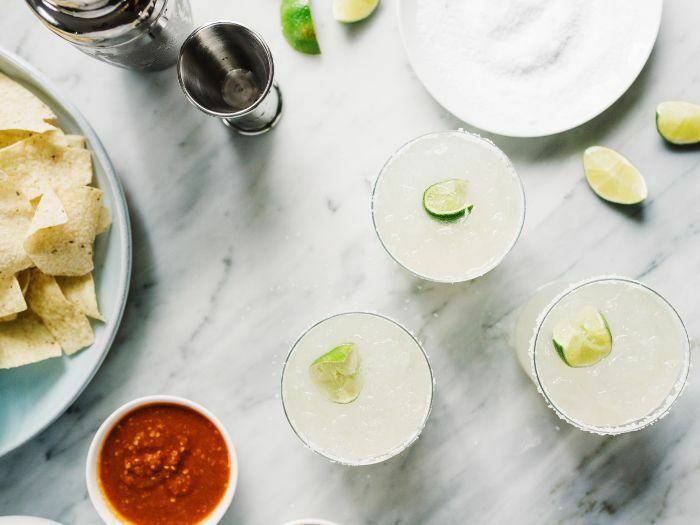 We welcome any excuse to indulge in a post-work margarita, and as such, we're stalwart proponents of the internet holiday known as National Margarita Day. With that said, we cringe when sipping a restaurant margarita that's more simple syrup than tequila—and loathe the sugar rush, bloating, and hangover that often accompany it. In the spirit of indulging without the guilt, we tapped the mixologists over at Don Julio for their healthiest, most refreshing margarita recipes. Generally speaking, Tequila Don Julio is a light, gluten-free, sugar-free, and fat-free choice, packing just 98 calories per 1.5-ounce serving, which is fewer than in a five-ounce glass of white wine. Combine Tequila Don Julio Blanco, fresh lime juice, and agave nectar in a cocktail shaker with ice. Shake well. Strain the drink through a fine strainer over fresh ice. Garnish with lime wedge, and enjoy! Add the rosemary to a cocktail shaker and muddle gently. Add Tequila Don Julio Reposado, fresh pear, sea salt, and lemon juice to a cocktail shaker with ice. Shake well. Strain the drink through a fine strainer over fresh ice. Top off the glass with the Health-Ade Kombucha. Garnish with a sprig of fresh rosemary and lemon wheel. Add pink peppercorns to cocktail shaker and gently muddle. Combine Tequila Don Julio Reposado, orange juice, and turmeric juice to the cocktail shaker with ice. Shake well. Strain the drink over a fine strainer over fresh ice. Garnish with pink peppercorns and orange wedge.